We’ll offer up a fantasy value, bust, and sleeper along with some rookies to know and dynasty quick takes for each team. In this edition, we examine the NFC South. 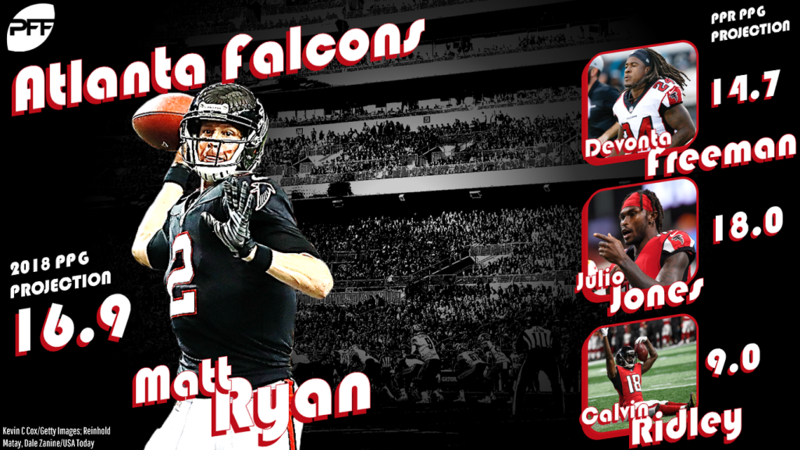 After flying high in 2016, the Falcons offense came crashing back to earth in 2017. Look for a slight rebound in 2018 — although maybe not back to the heights of 2016. Atlanta is one of the 10 best teams from a fantasy perspective this year. Julio Jones will likely at least double his touchdown production (he had just three last year), and the team’s backfield duo of Devonta Freeman and Tevin Coleman will return to their usual roles. The team added a first-round wideout talent in Calvin Ridley this year, and the still-young Austin Hooper will be looking to make his leap. Best fantasy value: Julio Jones, WR — Jones was a late-first- or early-second-round pick in fantasy drafts this year, and he has finished either first or second in receiving yards for three straight years. Fantasy bust: Tevin Coleman, RB — Coleman’s relatively high cost already makes him somewhat risky for a role player. He was fantasy No. 22 running back last year, and that’s about his ceiling. Sleeper to watch: Austin Hooper, TE — Hooper caught four of five targets for 42 yards and a score in the preseason. Hooper is entering his third year but he’s still only 23. Rookie(s) to know: Ito Smith, RB — Smith is behind Freeman and Coleman, but if something were to happen to either of them, he’d instantly get a chance to put up flex-worthy fantasy numbers. Best current player for their 2020 roster: Calvin Ridley, WR — Entering the 2020 season, Jones will be 31 and Ridley will be entering his prime with a first-round pedigree. 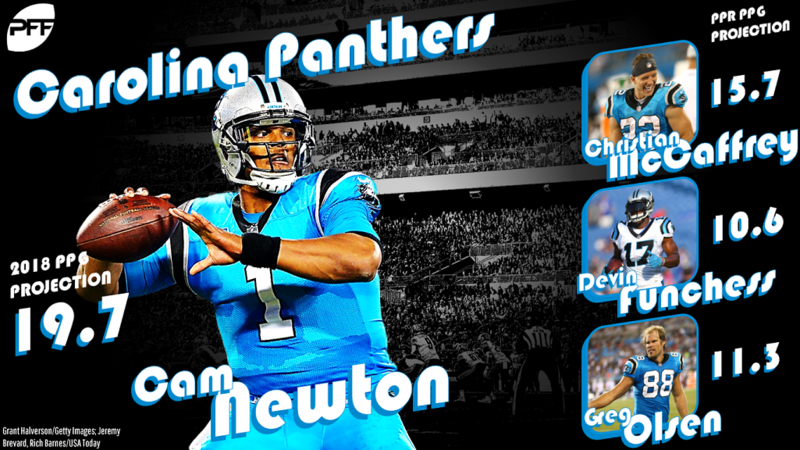 The Panthers are finally putting a strong offense around quarterback Cam Newton. Christian McCaffrey is entering year two and looks like a workhorse running back, Greg Olsen is returning from injury, Devin Funchess will look to build on his breakout campaign from 2017, and new first-round wideout D.J. Moore is now at Newton’s disposal as well. There are a lot of moving parts in Carolina, and the biggest question revolves around how the opportunities will be divvied up. Best fantasy value: Cam Newton, QB — Newton is fantasy’s biggest yo-yo player, but he has finished as a top-five fantasy quarterback in five of seven years in the league. Fantasy bust: C.J. Anderson, RB — When the first-team was on the offense this preseason, Anderson was nowhere to be found as McCaffrey took all the work. Sleeper to watch: D.J. Moore, WR — Outside of Olsen and McCaffrey, exactly how the targets are split up in Carolina remains to be seen. It wouldn’t be a shock to see Moore, a first-round pick, step up as the team’s primary outside threat. Rookie(s) to know: Ian Thomas, TE — Thomas is locked in behind Olsen, but he is an athletic monster who caught three passes for 37 yards and a score in the preseason. If anything happened to Olsen — who is 33 — Thomas would step into a valuable role. Best current player for their 2020 roster: Christian McCaffrey, RB — McCaffrey was a fantasy RB1 as a rookie with limited work on the ground (117 rushes), and he’s expected to be more of a workhorse for the Panthers this season and beyond. 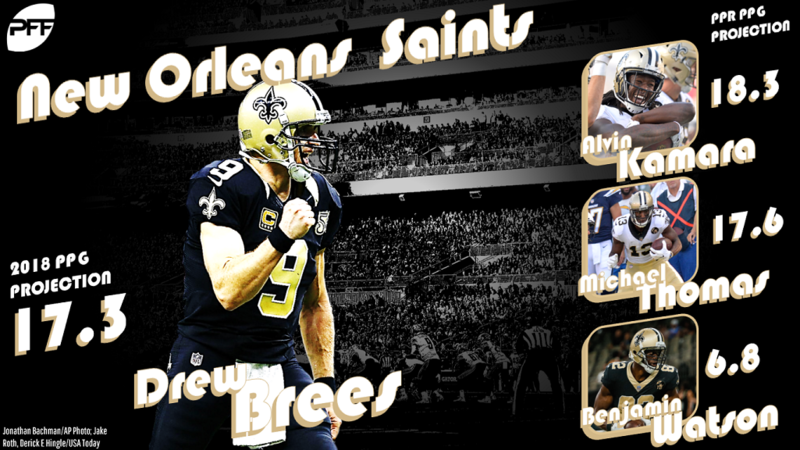 The Saints had long been a cast of Drew Brees and then everyone else, but they transformed into a run-first team last year on the backs of Alvin Kamara and Mark Ingram. The star-studded group — along with wideout Michael Thomas — returns in 2018. Ingram is suspended to begin the year, but Kamara should pick up the slack. And despite Brees’ “down” year from a raw numbers perspective, he was as efficient as ever. Best fantasy value: Michael Thomas, WR — Thomas, a second-round fantasy pick, is primed to put up 100-plus receptions, 1200-plus yards, and 6-10 touchdowns. Fantasy bust: Mark Ingram, RB — Ingram is suspended to begin the year, which will give the team a chance to see how Kamara does on his own; considering Kamara’s efficiency last year, that could push Ingram — who has had issues with the coaching staff in the past — a little down the totem pole. Sleeper to watch: Cameron Meredith, WR — Meredith was a top-25 receiver in terms of fantasy points per snap with the Bears in 2015. Rookie(s) to know: Tre’Quan Smith, WR — Smith dominated in the preseason, catching 15 of 17 passes for 189 yards and a score. Best current player for their 2020 roster: Alvin Kamara, RB — Kamara was a top-three fantasy running back as a rookie last year thanks in large part to his 81 receptions and 826 receiving yards; he’ll still be a strong dual-threat running back in his fourth year. 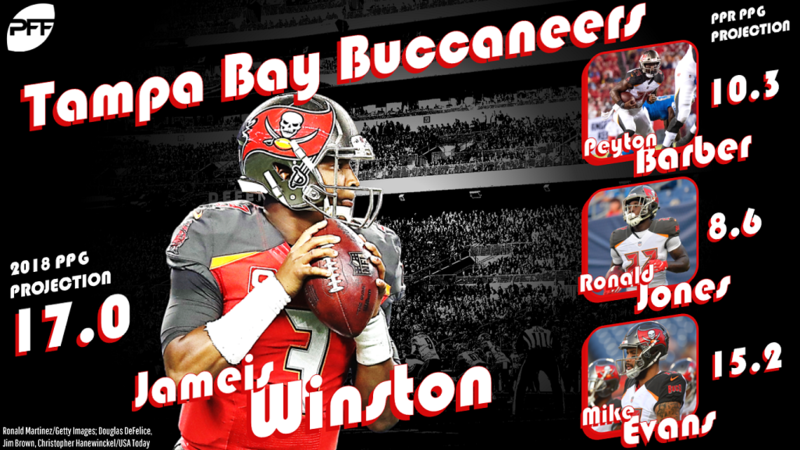 The Buccaneers are one of the most interesting teams from a fantasy perspective this year because the team is loaded with upside, but the path to success isn’t clear. Jameis Winston is suspended to begin the year, which means the team could get off to a sluggish start with Ryan Fitzpatrick under center. Mike Evans is primed for a rebound in the touchdown department, while Chris Godwin will look to supplant DeSean Jackson as the team’s primary No. 2 wideout. Rookie running back Ronald Jones flopped in the preseason, and the backfield appears to “belong” to Peyton Barber — for now. Best fantasy value: Mike Evans, WR — Evans is the only sure thing in Tampa Bay this year. He’s locked in for 130-plus targets, 70-plus receptions, 1,000-plus yards, and 6-10 scores. Fantasy bust: Ronald Jones, RB — Jones turned 28 rushing attempts into 22 yards (0.8 YPC) with a long gain of five yards this preseason. We can’t write someone off based on preseason alone, but he’s lost the starting job and looks like a fantasy bust as a rookie. Sleeper to watch: Chris Godwin, WR — Godwin was running with the first-team offense in the preseason, and he impressed in his role, catching seven of eight targets for 55 yards and two scores. Rookie(s) to know: Jones and Justin Watson, WR — Watson caught a team-high 12 passes this preseason for 130 yards and two scores. Best current player for their 2020 roster: Evans — Evans only just turned 25, which means he’ll still be 27 and in his prime in 2020. He’s locked in as a fantasy WR1 for years to come.